BLAEU -Freti Magellanici ac novi Freti vulgo Le Maire..
BLAEU,W. - Freti Magellanici ac novi Freti vulgo Le Maire..
Freti Magellanici ac novi Freti vulgo Le Maire.. - BLAEU,W. Size : 14.8 x 19.3 inches. / 37.5 x 49.0 cm. 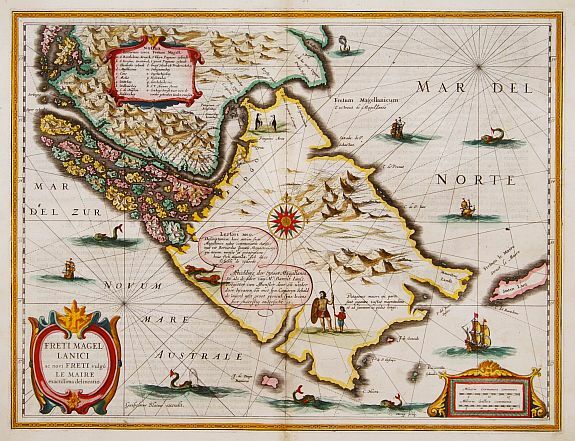 Description :Early impression of this fine map of Tierra del Fuego. With a Dutch translation of the explanatory text of the passage by Barent Jansz. Potgieter who accompanied captain Sebald de Weert to the Straits in 1599/1600, being the first Dutch vessels to sail through the Strait of Magellan. After various English voyages, the Dutch appeared in the Strait of Magellan in 1599. One of the Dutch pioneering voyages to the Southwest was the one by Jacques Mahu and Simon de Cordes, who were sent out by Rotterdam merchants. Condition : A fine copy.